I read a blog post yesterday reminding us that presenting the gospel as the solution to someone’s problems is at best only a partial truth. Jesus offers escape from ultimate judgement, yes, and intimate relationship with him, but not necessarily a more comfortable ride along the way. In our Western mindset it is easy to think that ‘choosing the right path’ results in ‘receiving material blessing and emotional wellbeing’, and if we haven’t got the latter, we must not have done the former. Verses like this totally contradict that idea. Jesus was clearly calling Saul, but his obedience would lead to his suffering. 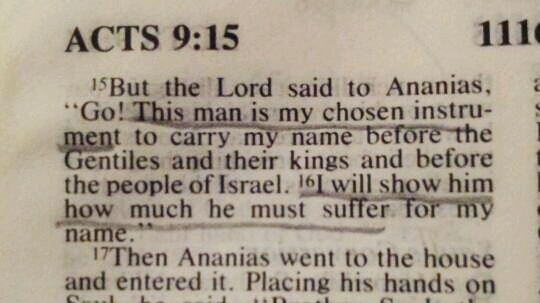 In the context of Ananias saying in the previous verses ‘hang on, this man has been persecuting us!’, this could be read as Jesus assuring him ‘It’s ok, I’m not going to let him off scot free’, but (thankfully) Jesus isn’t like that – his forgiveness when we repent is total, he doesn’t continue to hold us to account for the things his blood has already washed away. This was just a statement of fact. If you’re going through struggles and persecution, don’t take that as a sign that something has gone wrong, that God is not in control or that you’ve somehow slipped out of his will. It’s probably all part of the plan.